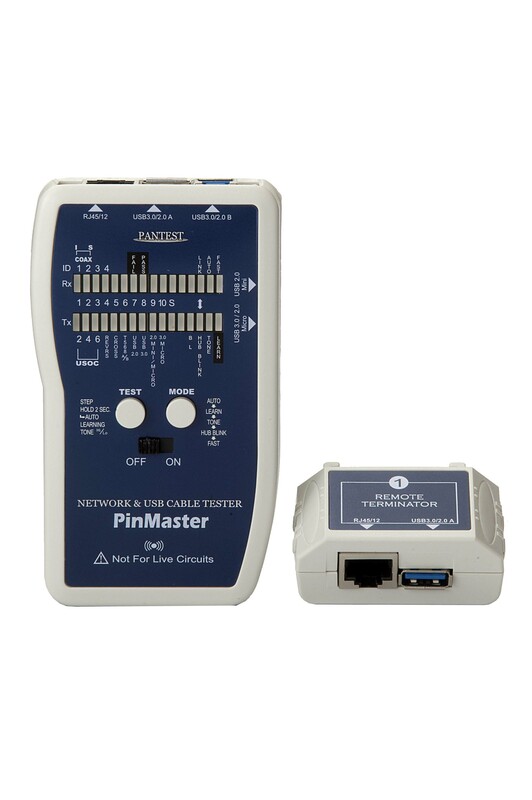 The PinMaster is designed to quickly and easily check all types of USB cables (USB 2.0, 3.0, A, B, 2.0 mini B and 2.0/3.0 micro B) and common cabling system includes Network/Data, Telephone/Voice and Coaxial/Video cables. PK-2018/2020 has an easy-to-read light bars (TX/RX) for displaying test results on the main unit and 2 buttons used to access each function, it provides the necessary complete connectors to test the various cable types with no need for adapters and determines cable run length up to 300m and up to 4 cable locations by one operator at a time, makes testing accurate and more efficient. PK-2020 includes 1394 firewire 6pin and 4pin connectors for testing 1394 cables. The unit combines (A). Fast test mode – displays the passed cable type, ID or a faulty cable in a second. (B). Pin-to-pin testing mode – includes continuity, open, shorts, miswire, shielding and pin configuration under both Auto Scan or STep Scan mode. (C). Learn/Quick test mode with memory capacity for testing quantity standard or custom cables for PASS/FAIL a snap, they’ve been able to speed its testing time. (D). Tone mode generates 2 able tones for use with Net Probe (PR-06P) for cable tracing. (E). Hub blink/link mode for locating an active Ethernet Port. If an Ethernet link is active on the cable, the tester will turn on it Link’s LED and begin flashing the link indicator port on Hub or switch at the other end, if no connection is made, the Link LED unlit. 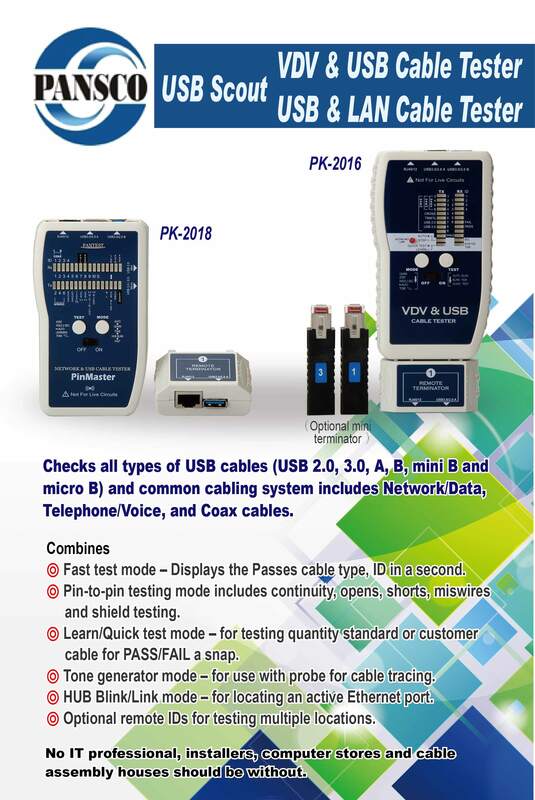 This new PK-2018/2020 enable one to verify the integrity of a cable before connecting equipment or after installation to ensure working properly, makes cable test, organize and port identification easily and quickly. The unit operates one 9-volt battery and features a battery low indicator to ensure proper working condition prior to use. The PK-2018/2020 is a capable and versatile tester that no IT professional, installers, computer stores and cable assembly houses should be without. Provides clear pin by pin wire mapping up to 10 pins and shield testing. Supports complete interface to test the various cable types with no need for adapters. Fast test mode displays the passed cable type and ID or a faulty cable in a second. Features Auto Scan and Step Scan modes for verifying cable pin configuration. Learn/Quick mode for testing quantity standard or custom cable for PASS/FAIL a snap. Tone mode generates two able tones for use with probe for cable tracing. Hub blink provides a simple method to identify Hub/Switch assignment on active net. Link indicator identifies cable termination on an active network ports. Optional remote ID #2 - #4 for testing multiple locations. Remote Unit: RJ45 jack, USB3.0A. Fast test, Auto/Step Scan, Learn/Quick test, Tone Generator, Hub blink and Link indicator. Wire mapping by pin-by-pin, Detects open, shorts, crossed, miswire and shield continuity. 650HZ ↔ 1 KHZ Alternating frequencies at two able tones. Operating: 0℃ to 50℃ (32℉ to 122℉). Storage : -20℃ to 60℃ (-4℉ to 140℉). Humidity: 10% to 90% non – condensing.